I have to admit that I am not very familiar with Kapampangan cuisine. I only came to appreciate their food when I dined at Cabalen Eat All You Can Eat All You Want at SM City Bacolod. 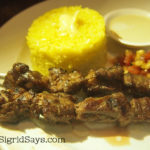 I first tried their house specialties like kare-kare, caldereta, and lechon kawali along with the yellow rice. Then, of course, there’s tokwa’t baboy, sizzling pork sisig, the grilled stuff, and the dessert. I was stuffed, needless to say. 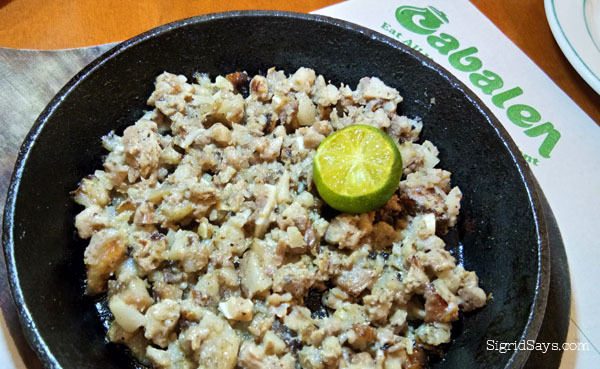 Pork sisig reportedly came from Pampanga. If this is the orignal, I am not sure. Anyway, they have different kinds of sisig. You have to order them from the staff if you want any of them so that they can prepare it and serve it sizzling hot. For the health conscious like my daughter, they also have a salad bar. I thought I covered almost everything, except the salad bar and halo-halo bar and I was already pleased. My tummy couldn’t take anymore, even if I just sampled their different offerings. 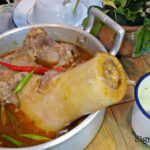 I concluded that Cabalen is all about rich heritage cooking where people who are not afraid of health risks can just enjoy all the flavors of soups, sauces, and dishes made rich by bone marrow, innards, peanuts, and the like. I have read that Kapampangan cuisine is mostly inspired by the Spanish but it also has a Mexican and Malay touch. A customer serves himself at the main courses station. But it was not until PRD Siony Aguila from the head office came out and talked to us that I have realized that I only uncovered half of the pleasures of Cabalen. 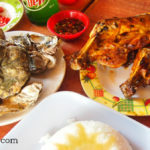 At Cabalen Eat All You Can Eat All You Want at SM City Bacolod, they have more than 40 dishes prepared for each meal. Each dish is prepared with care and following a strict recipe guideline. The kitchen principles they adhere to are based on the heritage Cabalen cooking and not patterned after a fast food. 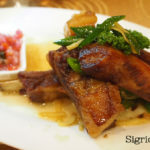 Vinegar-based dishes are already prepared the night before so that the meats or seafood can already soak up or cook in the acidity of the vinegar. 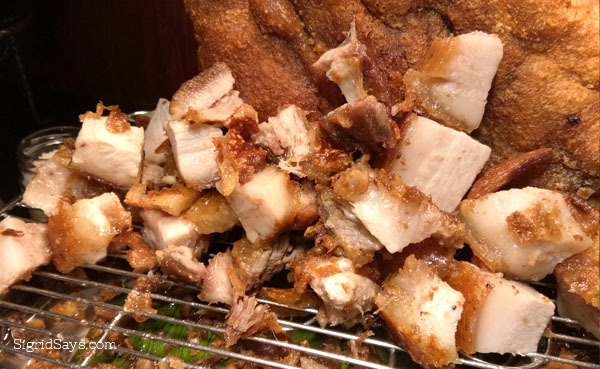 Lechon Kawali — so flavorful and the skin so crispy! 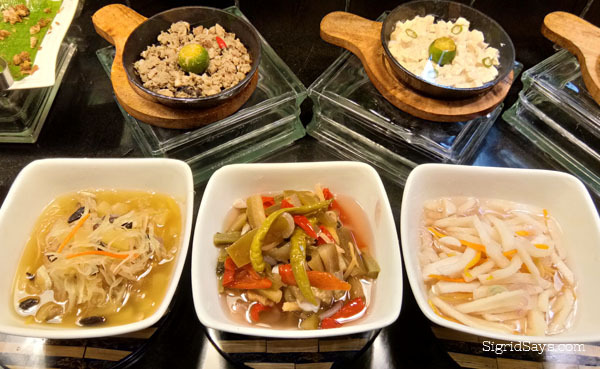 Additionally, it was explained to us that it is not just a mere eat all you can buffet with lots of extenders, but Cabalen serves a buffet of Kapampangan favorites. We had to go back to the buffet tables for further explanation. At the onset, you will see, smell, and taste that Cabalen food is yummy, hands down. But there are other things, too, that one should look into to further appreciate the different tastes of the intricate Kapampangan cooking. For example, we started with their achara (pickles). They serve three different pickles on bowls and you can freely get them and pair them with different fried and grilled dishes. Their achara is crunchy and has the perfect combination of sweetness, saltiness, and sourness that not bite your tongue. 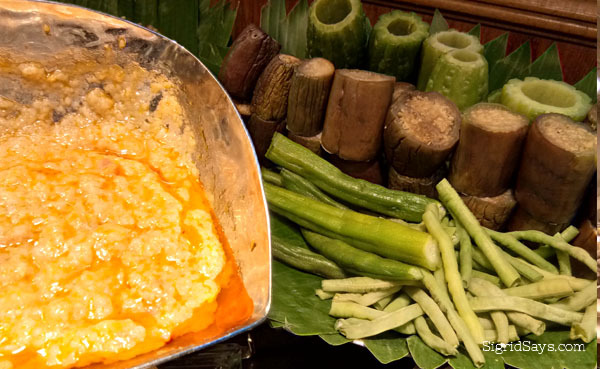 They can be eaten as appetizers by themselves, pwedeng paglihian ng buntis or may PMS (as pica for pregnant women or those with PMS), or as sidings with dried dishes where you mix it with every spoonful of rice. Three three kinds of achara, from left: papaya, mix vegetables, and singkamas. The middle one has chili and so it is mildly spicy. I like all of them! Another thing is the Burong Hipon. At first glance, I thought it was aligue, or crab fat. But Ms. Siony explained that it is actually made of ground or pounded rice with some shrimps and cured for nine days before serving. They prepare it meticulously in their commissary and are just sent to their different branches to maintain its quality. 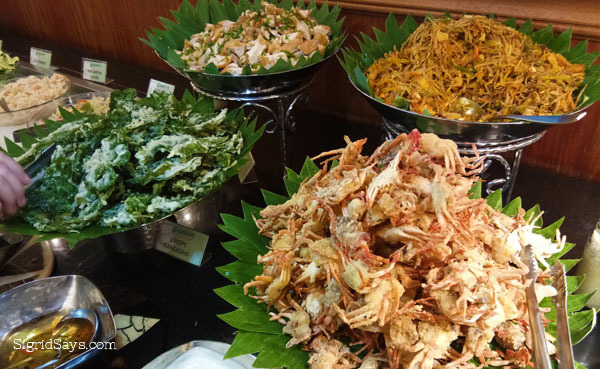 If you will notice at the buffet table, the buro is placed beside the blanched vegetables and grilled seafood. That is because it is a mild appetizer that enhancers the flavors of your bland vegetables or grilled food. Instead of the usual soy sauce sawsawan, you may try the buro with your food. And I really liked it, especially with the ampalaya (bitter gourd). Aside from all these that I mentioned, there are still many kinds of sauces and sidings that you will find there. Sample everything or you may ask assistance from their staff about which food is best paired with a particular condiment. Buro is a good flavoring and appetizer. Best eaten with steamed vegetables shown at the back. I am still no expert on Cabalen food, but I was happy to have been given a short tour. This is how I wan to appreciate my food–eating while soaking in the history and culture and the preparations done to come up with such a dish. The Philippines is a small nation but we are very regionalistic and it is often seen in how we prepare our food. And the best thing is, Cabalen has made the experience more realistic because they have especially designed their restaurant to depict the romantic interiors of pre-war Philippines with rich Spanish influences. You can see carved wooden designs, colored glass, and chandeliers dangling from the ceiling–all in a mall branch. 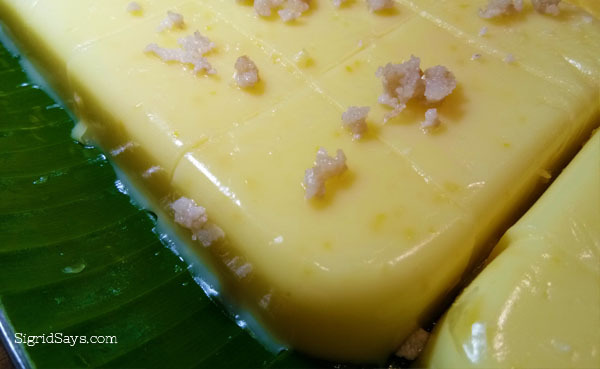 This is Tibok Mais–a Kapampangan dessert that is similar to the maja blanca. This one though is flavored with corn. So when dining at Cabalen, don’t just fill your plate and stuff your tummy. Ask questions and enjoy and you will bring your dining to a different level. 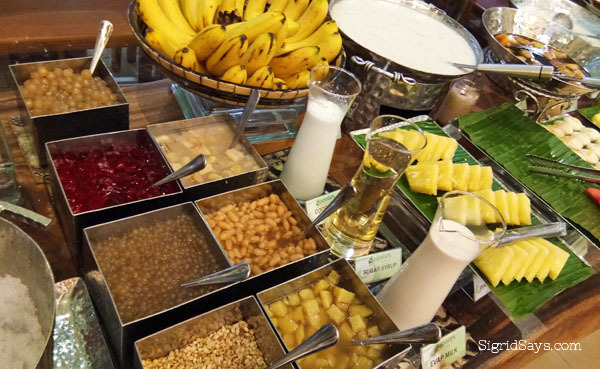 Regular buffet is P298.00 + VAT. No service charge. Contact Nos. 436-5922 or 0922-217-1009. 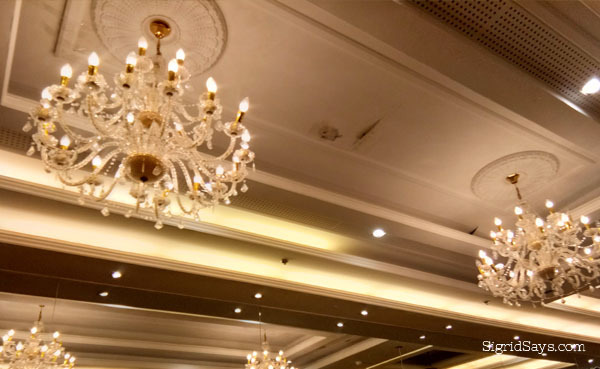 Function room also available. These soups are very rich. My daughter likes the batchoy soup. “Cabalen!” is how people from the province of Pampanga, Philippines call each other, much like “kababayan” in Tagalog or “kasimanwa” in Ilonggo. 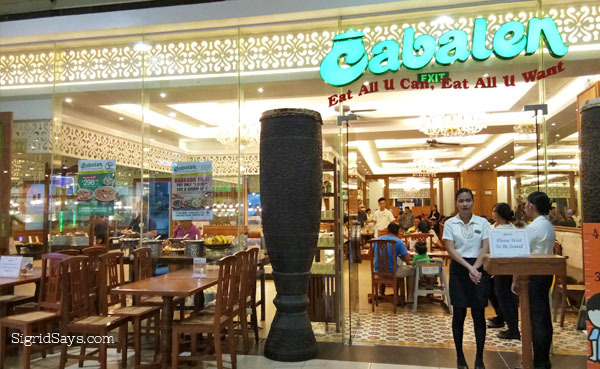 But around the country, Cabalen is a popular term that refers to the “eat-all-you-can” Filipino restaurant in the mall that is located all over the country, including Bacolod City and Iloilo City. It’s not clear how long, but Cabalen’s history may be traced to the Nievera family of San Fernando, Pampanga. They have started a Filipino delicacies called “Bahay Pasalubong” back then. But it was only in 1986 when they opened their first “Cabale Eat All U Can, Eat All U Want” Restaurant along West Avenue in Quezon City. 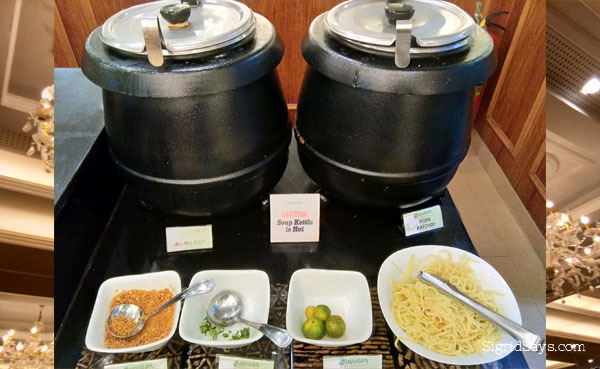 Now, 31 years later, Cabalen has grown into a multi-brand, national company, and they offers an All-Filipino buffet. 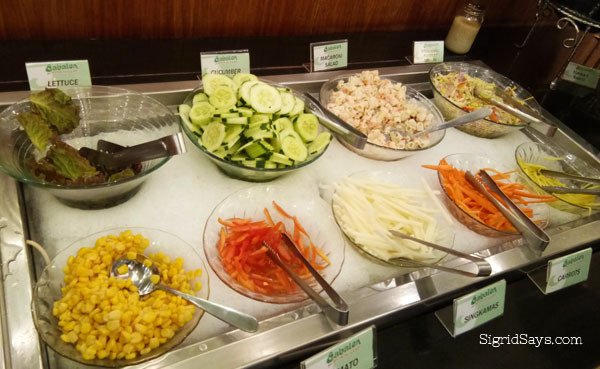 Select branches, such as the ones in SM Megamall, Robinsons Place Manila, and SM Mall of Asia, offer a wider buffet selection with their Filipino-Asian offerings. Ornate lighting and ceiling at Cabalen Bacolod reminiscent of old Spanish houses in Luzon. The Cabalen Group of Companies celebrates their 31st Anniversary by bringing you the most exciting prizes with their Eat, Repeat, Win and Travel Raffle Promo! Trips to Asia’s dream destinations are at stake–Hongkong and Disneyland; Bali, Indonesia; and Hanoi, Vietnam – awaits the three (3) lucky winners this year! Plus, they will also be giving away staycation packages to Bataan, Zambales, and Tanay, Rizal. Cabalen goes all out on their 31st Anniversary with an their Byahe Panalo sa Cabalen Raffle Promo! 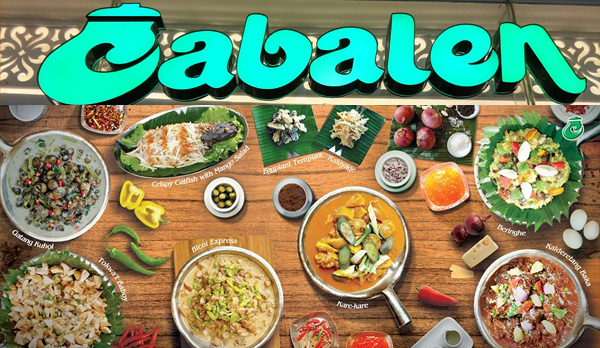 This promo is a collaboration of all their restaurants – Cabalen Eat All U Can, Eat All U Want, Soi Restaurant, Mangan Restaurant, Eat Pinoy, BKK Express, and Cerveseria. A minimum spend of P1,499 at any of these restaurants entitles you to one (1) raffle card for the Grand Draw. Upon completing your Grand Draw Entry, you also get a bonus P350 worth of Gift Certificate valid in all branches of Cabalen Group of Restaurants! Aside from the international trips and calming staycations, you also get a chance to win weekly prizes all throughout the month of August. You have the chance to win gadgets, various passes, and gift certificates every week! Hurry! Join their Eat, Repeat, Win & Travel Raffle promo now! For more details, see posters and prints or visit their official Facebook pages. Promo runs from August 1, until August 31, 2017. Per DTI-FETB Permit No. 10653 Series of 2017. Cabalen at SM City Bacolod. Oh my! What an amazing spread! I’ve always loved Kapampangan cuisine! Some will argue that it is the best cuisine in the Philippines, I’d say it is definitely one of the best I’ve tried so far. I’ve not tried their food. Looks delicious to me and much more after reading your description of the place, the food (how they are prepared). I look forward to checking out a Cabalen restaurant some time soon.